So, in this tutorial I'll be looking at converting to grey-scale, the channel mixer, the desaturate option, and the convert to black and white filter. Then I'll have a quick look at adding a colour tone to your image as well. So fire up Photoshop, grab a coffee, open up an image you want to convert to mono or black and white, and lets get started! Start Photos. I've copied together two examples of images I like to take at the moment, to show what the different black and white / mono conversion techniques have on different styles of photographs. 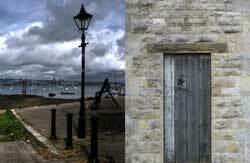 The one on the left is a HDR landscape, the one on the right some detail from a stone building. 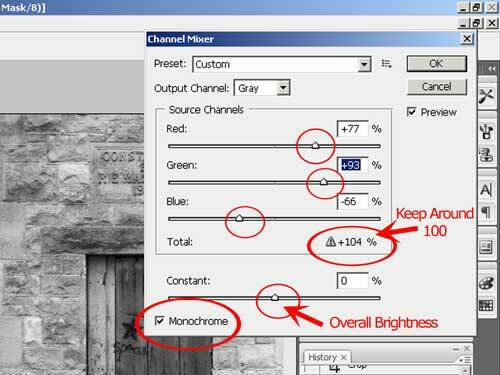 Make sure you convert back to RGB once you've got the b&w image - "image", "mode", "rgb color". This would be a more than acceptable starting point for further editing - we could increase the contrast, play around with levels and curves, and of course work on separate parts of each photo using layer masks. We really always want to avoid working on our original image - so we're going to be using adjustment layer techniques from now on. 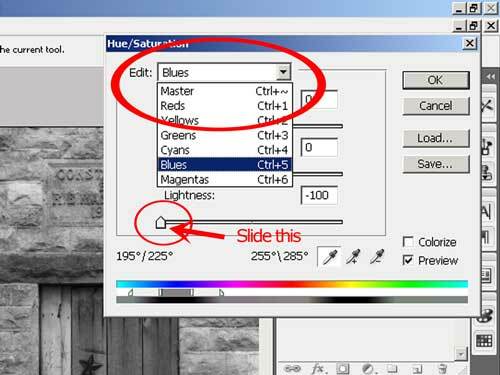 This makes it easier to make changes as we go on, and saves us from permanently altering our original photos - always a good thing! Photo's converted with channel mixer. The sky's a bit darker, I'd have to play around more with each individual image to get the look I wanted. 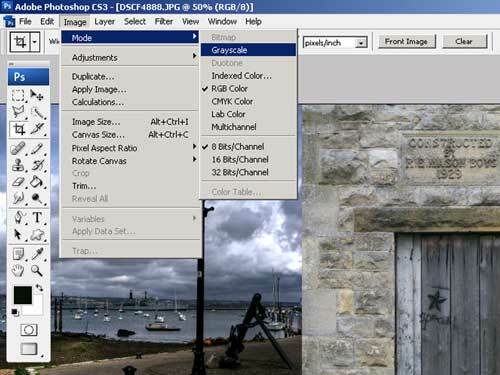 I find the channel mixer a bit complicated to use - you've got to slide one colour back when you increase a different channel, so I prefer to use a Hue / Saturation Adjustment Layer. 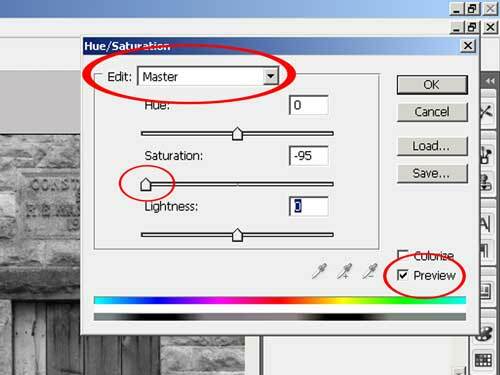 Hue / Saturation Adjustment Layer. 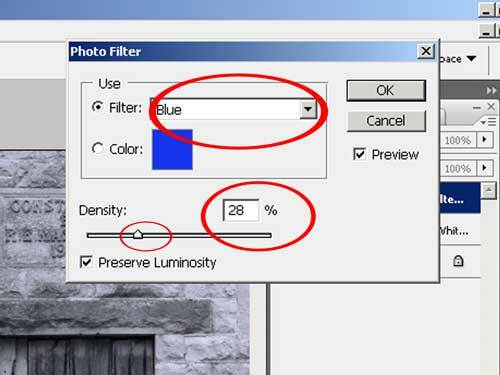 So, if you're working on a landscape photo and want to make the sky darker, change the blue channel. Want bricks darker? Change the red channel. Just play around to see what you can come up with. 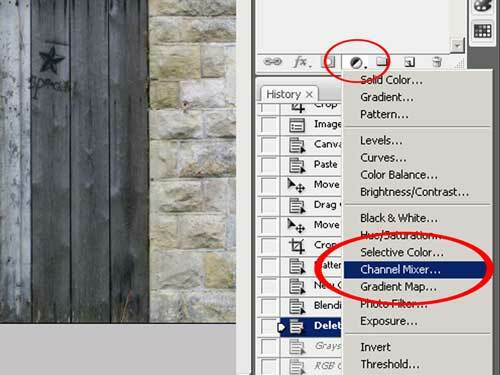 If you're not sure which channel to choose, click on your photo, Photoshop will choose the channel, then move the slider. By now you're probably thinking, big deal, there doesn't seem to be much difference between these black and white methods! And you'd be right, so next let's try the best way to convert to b&w, the Black and White Adjustment layer. 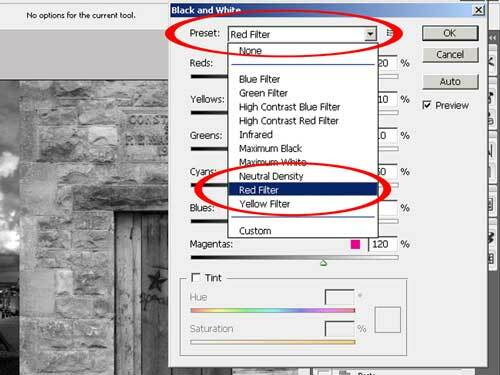 Black And White Adjustment Layer. 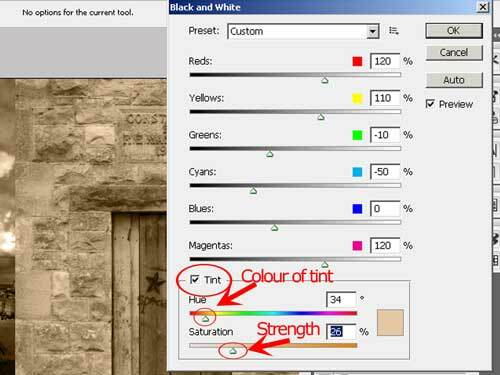 The Black and White Adjustment Layer is simulating the effect you'd get using the traditional method of shooting b&w film, and then putting a coloured filter on the front to darken specific parts of the spectrum. The red filter for example leads to darker skies. You can also customise the effect by clicking on parts of your photo and dragging to the left or right to change the lightness of that part of the image. How cool is that! 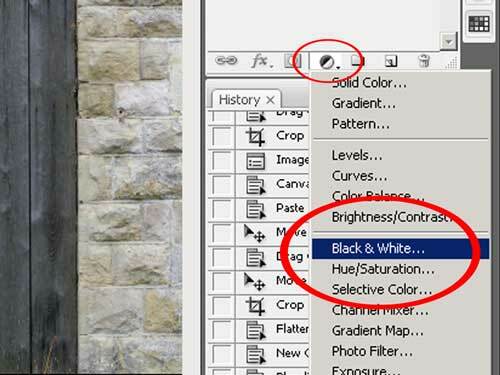 Black and White Adjustment Layer. (Red Filter Preset). Remember, these are all just starting points, the photo's could still do with levels, curves or contrast adjustments, but hopefully you'll know give the different black and white adjustment techniques a go, and see what works best for you. Image Tinted In Black & White Adjustment Layer. Add A Coloured Photo Filter To A Black And White Photo. You could always simply add a coloured filter to a photo that's already been converted to black and white. Then just choose a filter (sepia is popular, but I like Blue too), and adjust the "density" to change how strong the effect is. 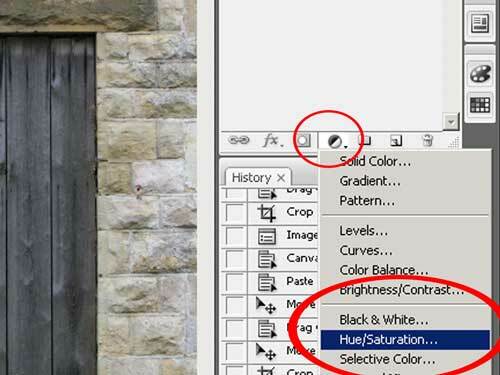 In my opinion, Photoshops "Black and White" Adjustment Layer is the best method for converting your photo's, but I have to admit that in Elements I often just strip the colour out with Hue / Saturation. 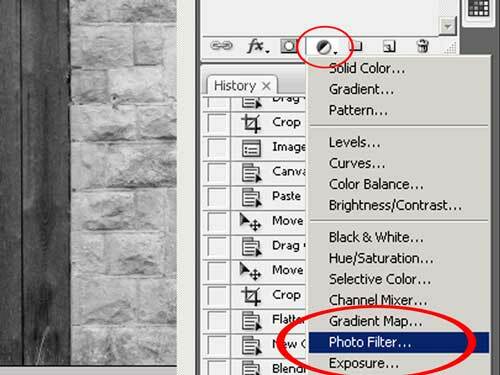 I think that in newer versions of Elements, Adobe have included a better b&w converter. As I've already said, the black and white / mono conversion is only the start of the editing process, a foundation to build on, and usually not a finished product. Just wanted to thank you Rob for all the pointers you've shared for black & white conversions. After a good study of your techniques and the link to Andreas Overlands work I've finally managed to crack what I was after. Using adjustment layers has made this a lot easier than previous methods I had tried and I can 'tweak' ad infinitum to achieve the desired results. With this new knowledge I've found that I can actually replicate some of the darkroom processes I used to use for film and wet prints. I've even found I can replicate subtle variations similar to selenium for increased Dmax, split-toning and split-grading for midtone boost. I thought I needed 'Lightroom', but this is all working fine with my old copy of paintshop. Thanks again for the inspiration and I really look forward to enjoying some good old black & white work again! Glad the article helped, for me I also like to play around with levels / curves and the blend mode of those layers to increase contrast. You really should start a Blog to explain all about your techniques for recreating the Film Look - lots of people would be really interested! Thank you for this tutorial. 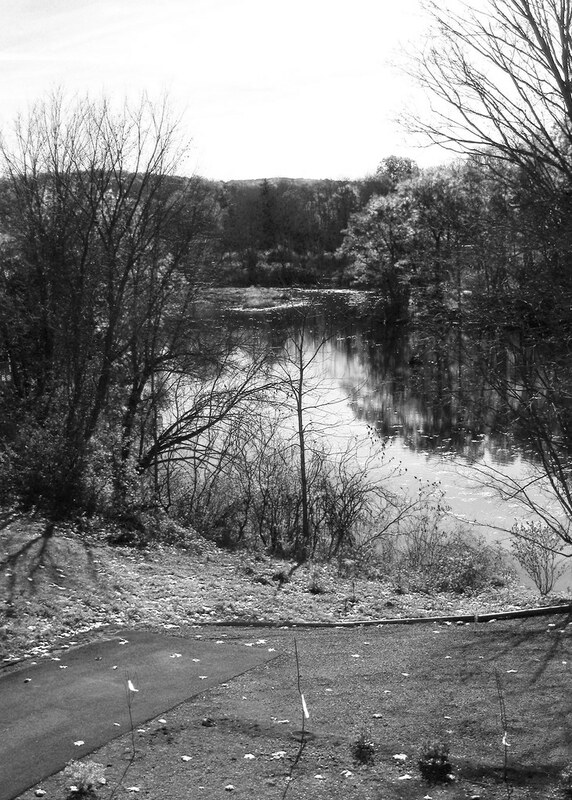 I just took a photo, that I thought might look better in black and white. I now remember why I would always use a yellow filter on my lens in my black and white film days. The yellow Photoshop filter proved perfect, although it was nice to be able to try others. There's something special about Black and White Photographs, I love 'em.